F4 - AIRPORT - ON THE WAY TO JAPAN · K-POPPED! Okay, that wasn’t really accurate. The main cast for Boys Before Flowers – the notorious Flower Four (F4) and Geum Jan-di (actress Gu Hye Sun) were at the airport, on the way to promote their drama in Japan. 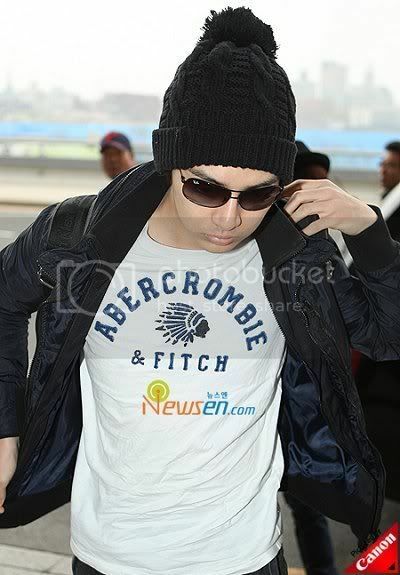 These pics were taken at Seoul’s Gimpo Airport on the morning of 15 April. Japan is where the original manga and drama – Hana Yori Dango originated from. KBS 2TV drama Boys Before Flowers (or Boys Over Flowers) started airing in Japan on April 12. In Japan, the cast will appear on one of Japan’s best talk shows SMAP X SMAP ‘스마스마’ on FujiTV. The program is hosted by SMAP members Kimura Takuya and Kusanagi Tsuyoshi. Hollywood stars such as Tom Cruise, Johnny Depp, Victoria Beckham have been on that program. Korean stars Rain (Jung Ji-hoon) and Jang Dong-gun were also guests before. F4 (Lee Min Ho, Kim Hyun Joong, Kim Bum, Kim Joon) and Gu Hye Sun will aslo meet with fans at Tokyo’s JCB Hall at an official Japanese fan meeting. Pop groups SS501 and T-MAX will be performing songs from the original soundtrack at the event. like the leader of a pop idol group (SS501) – i like! there are hardly any good shots of him at the airport. Plus he looks tired. pls scroll down to view the photos and article! Yeah, I can read Korean ^^. Check these out and have a good one! Some photos of Japanese fans lining up for the event, F4 + HS, SS501 performances, etc. overanalyzed and guessed that it's because Japan was not welcoming and dissing Korean version of BOF and stuff…. "…But, who really cares? To the Japanese producers of the show, obviously the adapted version of their own manga is not worth their time." (In order to 'reply', I had to join wordpress website, haha). due to their hectic schedule on April 15th! They arrived at the last min of the show. So afterwards, another 30 min-portion of the talk show was shot, which will be airing in Japan soon. Pls write about the ENTIRE truth on FACTS in your blog before dissing..
BOF’s promotional trip to Jp was very successful. although a ticket cost about 120~140 US dollars! Each event took two & a half hrs. According to about 8 articles I’ve read today from the Korean Internet source, there was endless laughter and admiration from the audience – Jap fans went nuts about those eye candies (including SS501)! Hye Sun can be so pretty. I wish she would do her hair differently than just letting her bangs fall into her face. C’mon. She’s not JanDi anymore and can come out of that hairdo! haha thanks for clearing that up. when she said drama i assumed an actual tv drama and not a film. but cool info though. i kinda miss Junpyo’s curly hair you know. without it, minho looks so plain. oh, loving my kim joon!! The MCs and a transgender actress at the Jp show were shocked how good-looking F4s were and exclaimed that they were really handsome. The transgender actress approached Hyun-joong and said he smelled very good. The main MC asks how they feel in Japan and if there’s someone who speaks Japanese. Hyun-joong, (a member of SS501, who’s been to Japan for live performances numerous times and who’s already very popular in Japan) speaks in Japanese that he’s very glad that so many fans came to the show. but after the live show on the TV set, F4 and HyeSun had a lengthy meeting with the fans and an interview! i’m still in love with them! thanks for the news update Orchid! Jjang! true, the manga originated from japan but don’t forget the first drama version was from taiwan! Thanks for that YouTube link of BBF in Sakaseusang. * They all co-ordinate their dressing. White, grey and beidge. Very cute! Thanks! I love the pics! And all the boys look great…love LMH's juice and book, haha! Scruffy KHJ <3! 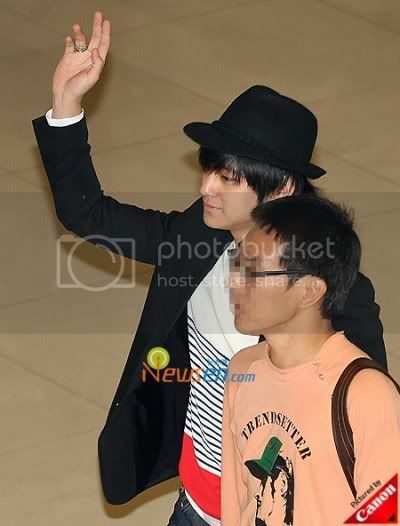 Kim Bum and Kim Joon always lack pics, but the ones they do have are awesome! @spicySALSA & the rest who are interested in pics of the guys arriving in Japan. They are all so beautiful. I want to go to Korea and date them! So now there’s the Japanese F4, Taiwanese F4 and Korean F4. Eh, I tot Flower Four (F4) is a boy group from Taiwan? The place where Vanness (Kangta & Vanness)came from. As for KJH’s hair colour…oh ya! He’s changed it!! I'm feeling what Tashna is saying! *prays for kind subber* SMAP & F4 in the same room… bring it on!! LMH looks like he’s put on some pounds huh..? Kim Hyun Joong’s hair color is different. I guess he dyed it back to his more original color. I miss BOF!! ahhh~~~ Minho totally rock with black!!! Im so excited, I hope someone subs that SMAPxSMAP episode with them on it, its sure to be interesting! my precious Geum Jan Di is always that cute….. Guess what… BOF pirated CD is on sale in malaysia with english, malay and chinese subtitle… I am soo sweat!!! They are damn fast!! !